The Evangelical Church in Germany (German: Evangelische Kirche in Deutschland, abbreviated EKD) is a federation of twenty Lutheran, Reformed (Calvinist) and United (Prussian Union) Protestant regional and denominational churches in Germany, collectively encompassing the vast majority of Protestants in that country. Because of its denominational differences, the EKD is not a church in a theological understanding. In 2012, the EKD had a membership of 23,356,096 members, or 29.0% of the German population. It constitutes one of the largest national Protestant bodies in the world, behind the Church of England and the Church of Christ in Congo. 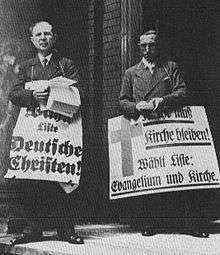 Historically, the first formal attempt to unify German Protestantism occurred during the Weimar Republic era in the form of the German Evangelical Church Confederation, which existed from 1922 until 1933. Earlier, there had been successful royal efforts at unity in various German states, beginning with Prussia and several minor German states (e.g. Duchy of Nassau) in 1817. These unions resulted in the first united and uniting churches, a new development within Protestantism which later spread to other parts of the world. When Adolf Hitler came to power in 1933, his administration tried to reorganize the old confederation into a unified German Evangelical Church as Hitler wanted to use a single Protestant church to further his own ambitions. This utterly failed, with the Confessing Church and the German Christians-led Reichskirche opposing each other. Other Protestant churches aligned themselves with one of these groups, or stayed neutral in this church strife. In 1948, the Evangelical Church in Germany was organized in the aftermath of World War II to function as a new umbrella organization for German Protestant churches. As a result of tensions between West and East Germany, the regional churches in East Germany broke away from the EKD in 1969. In 1991, following German reunification, the East German churches rejoined the EKD. This changed somewhat with growing religious freedom in the 19th century, especially in the republican states of Bremen, Frankfurt (1857), Lübeck, and Hamburg (1860). The greatest change came after the German Revolution, with the formation of the Weimar Republic and the abdication of the princes of the German states. The system of state churches disappeared with the Weimar Constitution, which brought about disestablishment by the separation of church and state, and there was a desire for the Protestant churches to merge. In fact, a merger was permanently under discussion but never materialised due to strong regional self-confidence and traditions as well as the denominational fragmentation into Lutheran, Reformed, and United and uniting churches. During the Revolution, when the old church governments lost power, the People's Church Union (Volkskirchenbund) was formed and advocated unification without respect to theological tradition and also increasing input from laymen. However, the People's Church Union quickly split along territorial lines after the churches' relationship with the new governments improved. In July 1933, the German Evangelical Church (Deutsche Evangelische Kirche, DEK) was formed under the influence of the German Christians. The Confessing Church arose in resistance to the Nazi regime's ideology. The National Socialists had much influence over the decisions of the first National Synod, via their unambiguous partisanship in successfully backing Ludwig Müller for the office of Reich bishop. He did not manage, however, to prevail over the Landeskirchen in the long term, and after the installation of Hanns Kerrl as minister for church matters in a Führer-directive of 16 July 1935 and the foundation of the – in the end not materialising – Protestant Reich Church, the DEK played more or less no further role. Protestantism is the major religion in Northern, Eastern and Middle Germany: the Reformed branch in the extreme northwest and Lippe, the Lutheran branch in the north and south, and the United branch in Middle and Western Germany. 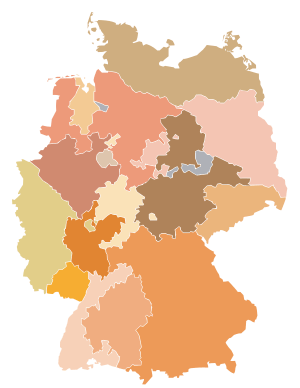 While the majority of Christians in Southern Germany are Roman Catholic, some areas in Baden-Württemberg and Bavaria are predominantly Protestant, e.g. Middle Franconia and the government region of Stuttgart. The vast majority of German Protestants belong to a member church of the EKD. With 25,100,727 members in 2006, around 30 percent of all Germans belong to a member church of the EKD. Average church attendance is lower, however, with only around a million people attending a service on Sunday. The regional Protestant church bodies accept each other as equals, despite denominational differences. No member church runs congregations or churches in the area of another member church, thus preventing competing with each other for parishioners. The only exception is the Evangelical Reformed Church, which combines Reformed congregations within the ambits of usually Lutheran member churches, which themselves do not include the eventual local Reformed congregations. E.g. a Lutheran moving from a place, where their parish belongs to a Lutheran member church, would be accepted in their new place of domicile by the locally competent congregation within another member church, even if this church and its local parish are Reformed or of united Protestant confession, with Lutheran being exchangeable with the two other respective Protestant confessions within the EKD. This is due to full pulpit and altar fellowship between all EKD member churches. In this the ambits of the member churches resemble dioceses of the Anglican or Roman Catholic churches, however, else there is no common hierarchy supervising the member churches, who are legally independent equals with the EKD being their umbrella. Members of congregations within the member churches – like those of parishes within Catholic dioceses and those enrolled in Jewish congregations also enjoying statutory corporation status –, are required to pay a church tax, a surcharge on their normal income tax collected by the states of Germany and passed on to the respective religious body. 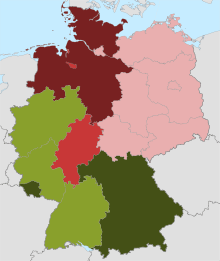 Red denotes states with a (relative) majority of EKD Protestants in Germany. The Synod is the legislature of the EKD. It has 126 members - 106 elected by Landeskirchen synods and 20 appointed by the Council. These 20 are appointed for their importance in the life of the Church and its agencies. Members serve six year terms and the synod meets annually. 1 2 EKD-Internearbeit (5 May 2015). "Short History". Retrieved 8 July 2015. ↑ The numbers of specific denominations are approximate. ↑ Peter Terrell, Harper Collins German Unabridged Dictionary, 4th ed., (New York: HarperCollins Publishers, Inc., 1999), 273 sub loco. 1 2 D. Karl Bornhausen, "The Present Status of the Protestant Churches in Germany," The Journal of Religion, Vol. 3, No. 5 (Sep. 1923), 501-524. ↑ The Eastern churches were the Evangelical Church of Anhalt, Evangelical Church in Berlin, Brandenburg and Silesian Upper Lusatia#Evangelical Church in Berlin-Brandenburg (EKiBB, East Ambit, for East Berlin and Brandenburg), Evangelical Church of the Görlitz Ecclesiastical Region, Evangelical Church in Greifswald, Evangelical Lutheran Church of Mecklenburg, Evangelical-Lutheran Church of Saxony, Evangelical Church of the Church Province of Saxony (KPS), Evangelical Lutheran Church in Thuringia and Evangelical Church of the Union (East Region, for EKiBB-East Ambit, Görlitz, Greifswald and KPS, and since 1970 for Anhalt too). ↑ The Western churches were the Evangelical Church of Baden, Evangelical Lutheran Church in Bavaria, Evangelical Church in Berlin, Brandenburg and Silesian Upper Lusatia#Evangelical Church in Berlin-Brandenburg (EKiBB, West Ambit, for West Berlin), Bremian Evangelical Church, Evangelical Lutheran Church in Brunswick, Evangelical Lutheran Church of Eutin, Evangelical Lutheran Church in the Hamburg State, Evangelical-Lutheran Church of Hanover, Protestant Church in Hesse and Nassau, Evangelical Church of Hesse Electorate-Waldeck, Church of Lippe, Evangelical Lutheran Church in Lübeck, Evangelical Reformed Church in Northwestern Germany, Evangelical Lutheran Church in Oldenburg, Evangelical Church of the Palatinate, Evangelical Church in the Rhineland, Evangelical Lutheran Church of Schaumburg-Lippe, Evangelical Lutheran Church of Schleswig-Holstein, Evangelical Church of the Union (West Region, for EKiBB-West Ambit, Rhineland, and Westphalia), Evangelical Church of Westphalia, and Evangelical Church in Württemberg. ↑ Deutsche Welle, 2009-10-28. German Protestant Church elects first woman as its leader. Retrieved 2009-10-29. ↑ Ökumenische Arbeitsgruppe Homosexuelle und Kirche (HuK) e. V.: Möglichkeiten der kirchlichen Segnung gleichgeschlechtlicher Paare, 25 April 2016. ↑ Johannes Süßmann, Anne Kampf: Segnung Homosexueller: Bunt wie ein Regenbogen. Evangelisch.de, 14 January 2016. ↑ EKD-Internearbeit (6 January 2011). "Christians in Germany 2006". Retrieved 8 July 2015. ↑ EKD Internetredaktion. "EKD: Evangelische Kirche in Deutschland - Christen in Deutschland". Retrieved 8 July 2015. ↑ EKD: Services of Worship and Holy Communion 2006. Accessed 16 March 2010. ↑ "Zensusdatenbank - Ergebnisse des Zensus 2011". Retrieved 8 July 2015. ↑ "Startseite - Gustav-Adolf-Werk e.V.". Retrieved 8 July 2015. ↑ EKD-Internearbeit (24 March 2015). "Regional Churches". Retrieved 8 July 2015.